Reflections of a Grady Doctor: The lady in the street. Why didn't you call 911? Some missed opportunities to do good may never come again. I believe we are tried and tested daily. If we fail the lesson/test it will come again until we do the right thing. Here in Texas, I would fear for her physical safety and would have to help any woman in that situation. Police tend to shoot such people. At the end of the day you chose to do what you felt was right. I wouldn't say "right". Honestly, I wished I had a clear idea of something to do. 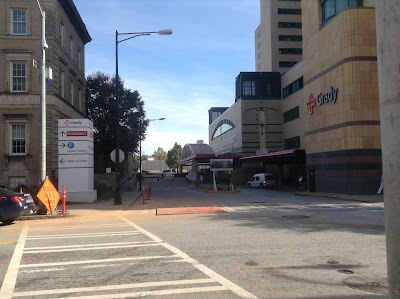 There's just this overwhelming helplessness you feel sometimes in places like downtown Atlanta when you see something like this--especially this part of downtown Atlanta. There's a lot of drug use and people with unstable housing--some of whom behave erratically. 911? I'm not so sure. I think if I had believed police would come and do something I may have been more likely to have called. But I could be wrong. I doubt they'd shoot her. Not finding it emergent though? Maybe. Or an indecent exposure arrest followed by her being sent right back where she was. A lot is broken. Know this: I wanted her to be safe, too. I feared of a lot of things for her. And still do. Thank you for your comment. Sometimes it simply is not ours to control. Merely to witness. Thank you. Seriously, thank you for these words and just for being you.